The above quote was copied, verbatim, from a post made to the Facebook Authentic Blogger group page today. Authentic Blogger (aka AB) was born last night, December 21st around 9 pm, EST, the brainchild of myself and my partner in crime, Marty. We are fellow bloggers who met when we both started our respective blogs back in September 2009. Over the course of the past several months, we have visited via FB posts, emails, blog comment posts and phone calls, sharing our enjoyment and frustrations with the blogging world. I think everyone sits back and has those "I'd do it this way instead" type of thoughts about any given activity in which they've become involved. Marty and I were no different and we began discussing more and more, our wishes and wants for the blogging world. This culminated in an impromptu suggestion from one of us...not sure who suggested it first....to create our own community on Facebook. Somehow, we've stumbled upon this unique and ideal partnership where the two of us are very complementary in our respective skillsets. Marty is much more IT savvy and I'm strong with marketing copy, taglines, design, etc. To be fair, we're both pretty good at several of those, and we're both strong writers. Everything has meshed into this beautiful partnership and we've created Authentic Blogger for all the other bloggers out there in the world who have been looking for such a community. I think I can speak for Marty as well when I say that we're both very happy we've struck such a strong, common chord for everyone. We're looking forward to the growth of our group and seeing how it will impact our group members and friends. Jenn Boyer is the group member who wrote the above very kind, encouraging comment, so thanks Jenn! We appreciate the positive feedback and hope other members will take a moment here and there to post ideas, suggestions, tips and more encouragement. Marty and I knew we had a solid concept with this group page idea, but I must admit, neither of us were quite prepared for the enthusiastic response we've been getting. We LOVE it and hope it continues and compounds daily! Our immediate goal is to reach 100 members before we hit the 12 hour mark of existence, which is 9 pm, EST today, December 22, 2009. As I write this post, we are currently 69 group members strong! Absolutely, incredibly wonderful! 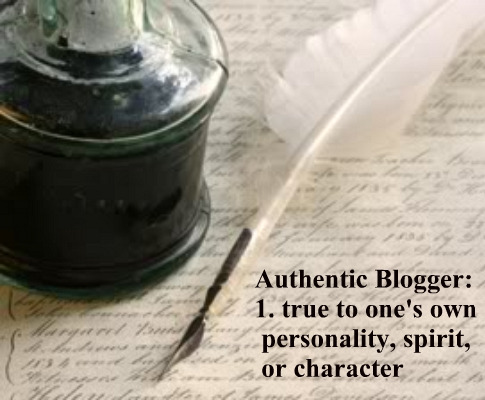 We cordially invite you all to tell your blogging friends about Authentic Blogger. Don't forget to post your most recent blog entries on our wall each time you visit - this will guarantee that you get more exposure to your specific blog site and the upshot is, you'll gain followers and increase traffic and readership to your site. We want everyone to benefit from being a part of the Authentic Blogger community. Keep the posts coming!!! **Note: in my rush and whirl of activity today dealing with AB issues, I overlooked creating a hyperlink to Jenn Boyer's blog. Jenn kindly pointed out this oversight, so I am re-posting both here and on the AB group page. Jenn, my apologies for the oversight and my thanks for your gracious understanding!